You Deserve The Kitchen Of Your Dreams. You need and deserve a high-quality, risk free kitchen remodel in Boston! Your Boston home’s kitchen should be gorgeous and even downright breathtaking, while also providing ample room for entertaining family and friends and customized storage to fit your every need. If you’re considering a Boston kitchen remodel, check out a few ideas to incorporate into your home, as well as why you should choose Risk Free Kitchen Remodeling Boston for the project! If your home’s kitchen doesn’t take your breath away with its look and feel alone, then it’s time for a new kitchen design! Whether the space is cramped and crowded with little room for entertaining, or if the layout is simply awkward and outdated, a kitchen renovation in your Boston home can create an entirely new kitchen you’re sure to love. A complete kitchen remodel might remove walls so that the room’s footprint is larger and more comfortable for entertaining. Appliances can also be relocated so that they’re more accessible and closer to the kitchen island, or to allow for more prep space to be added between them. Whatever your needs for the kitchen’s footprint itself, its entire layout can be reworked in your kitchen remodeling for a Boston MA home, so that the space is more comfortable and welcoming overall. Our Boston kitchen renovation contractors can show you all the upscale and custom features you need to make your home’s kitchen fabulous as well as functional. These features might include a six-burner gourmet stove, a refrigerator with over sized shelving and deep freezer drawers, or a programmable dishwasher with dozens of customizable options. Specialty appliances can also be included in your kitchen design for a Boston home. Many homes in the Boston area today include a wood-burning pizza oven, a double oven, a counter-top dishwasher for lighter loads, and a separate cooler meant specifically for keeping wine at just the right temperature. Whatever your dream for a modern, traditional, or European style kitchen, we can make that dream a reality! What type of countertops work best in a new Boston kitchen design? Granite is still a classic choice for many Boston area homes, as this material is dense and durable and easy to clean. The natural veining and flecks in granite also give countertops lots of depth and color, and the stone is available in a wide range of tones, from a deep black to a beautiful earthy green or sandy beige. Our Boston kitchen remodeling contractors can also show you a beautiful selection of quartz, which mimics the look of stone but needs less maintenance over the years. Soapstone is superb at resisting heat, perfect for the gourmet chef who is always running out of trivets, while recycled glass is clean, bright, and eco-friendly, and works well in any style of kitchen redesign. Adding new countertops, appliances, and modern kitchen cabinets in a Boston home are some of the best ways to improve your home’s overall value. 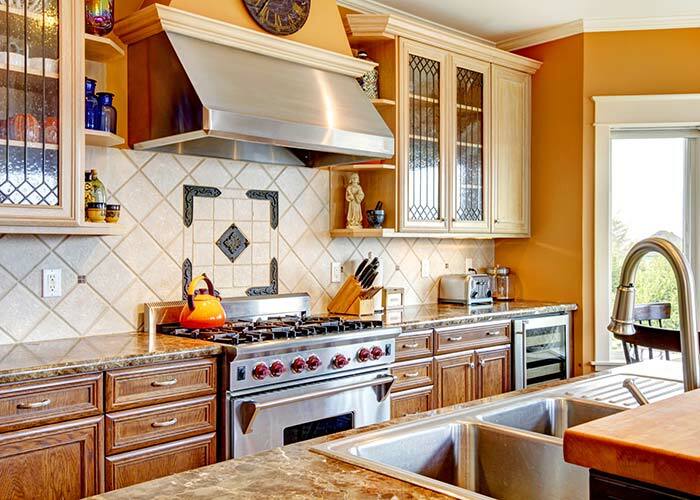 Homebuyers prefer a house with an updated kitchen, so real estate appraisers often take great pains to review the appearance and function of your kitchen when determining property values. The design experts at Risk Free Kitchen Remodeling Boston can help you determine the best plan for a kitchen remodel that will add value to your home. We can even help you find the best kitchen remodel financing options so you can easily afford all those beautiful, upscale features and design options you’ll love for as long as you own your home. Risk Free Kitchen Remodeling Boston may not be the cheapest company for your kitchen remodel in Boston, but we know we’re the best! While other kitchen remodeling companies often demand full payment up front, you keep 50% of your money until our job is complete when you work with us. We also lock in our prices for a full year, so there is no pressure and no gimmicks. Our work begins when you’re ready and will finish on time, every time! Whether your kitchen just needs a facelift or a full redesign, we bring old-fashioned American values of honesty, integrity, and attention to the finest detail to every home we service.